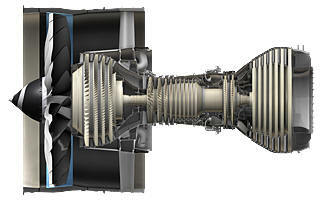 December 12, 2009 – GE Aviation will begin certification testing of their new H80 turboprop engine. The GE H80 turboprop engine, which will produce up to 800 shaft horsepower (shp) to power utility, agriculture and business and general aviation aircraft. Component testing of the H80 engine has been underway for several months, and GE has recently started aeromechanical and performance testing on test engines. "The results from our component and engine demonstration tests of the H80 engine have been very positive, and we look forward to the start of certification testing on the H80 engine, which is the first new commercial turboprop engine for GE in more than a decade," says Brad Mottier, vice president and general manager of the Business and General Aviation organization at GE Aviation. The H80 engine combines the elegant, robust design of the M601 engine with GE's 3-D aerodynamic design techniques and advanced materials to create a more powerful, fuel-efficient, durable turboprop engine with significantly enhancing hot-day takeoff performance and high-altitude cruise speeds. The H80 engine will also feature an extended service life of 3,600 flight-hours and 6,600 cycles between overhauls. Engine certification of the H80 is expected in early 2010 with entry into service on the Thrush 510 to quickly follow. Last summer, GE acquired certain assets of Walter Engines a.s., an aircraft engine design and manufacturing company with a distinguished history in aviation. Since that time, the new business, GE Aviation Czech s.r.o., completed its move to a new 135,000 square-foot facility in Prague. The site also boasts new engine test cells, which were completed earlier this month. The GE Aviation Czech facility employs about 400 employees. GE Aviation, an operating unit of General Electric Company (NYSE: GE), is a world-leading provider of commercial and military jet engines and components as well as avionics, electric power, and mechanical systems for aircraft. GE Aviation also has a global service network to support these offerings.